In the time of ancient Gods, Warlords and Kings, a land in turmoil cried out for a hero...and we found her..actually we found two of them! The story goes back to March 1995 and not September 1995. It goes back to a time of gods and kings and to the legendary Hercules. 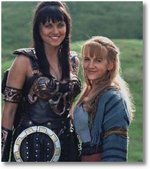 Xena was born on Hercules on 13 March 1995. We all know what happened; we know the history but because I'm writing a 15 year tribute...we go down memory lane.